The Carver Police Department is located on Route 58 in Carver, Massachusetts. 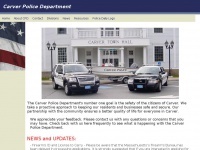 The Carver Police Department is a full time police department located in Plymouth County Massachusetts. The web server used by Carverpolice.org is located in Jacksonville, USA and is run by Network Solutions, LLC. On this web server 41 other websites are hosted. The language of those websites is mostly english.